MACD ( Moving Average Convergence/Divergence) is a technical indicator developed by Gerald Appel for the evaluation and prediction of price fluctuations in the stock and currency markets. For the MACD calculation, an exponential moving average with a larger period is subtracted from a moving average price (usually an exponential MA with a smaller period is used. In most cases, the result is smoothed using EMA to eliminate random fluctuations. Determining the beginning and the end of an impulse movement. Let's start with the impulse. The first screenshot features three histograms: a) dark gray (impulse) b) gray (corrective) c) light green (signal). Also it has a signal line (brown). Impulse histogram is the price movement acceleration. If the histogram is above 0, then an upward movement is developing. If it is below 0, the movement is downward. Important! the impulse histogram should be above the signal line for the upward movement and below for the downward movement. 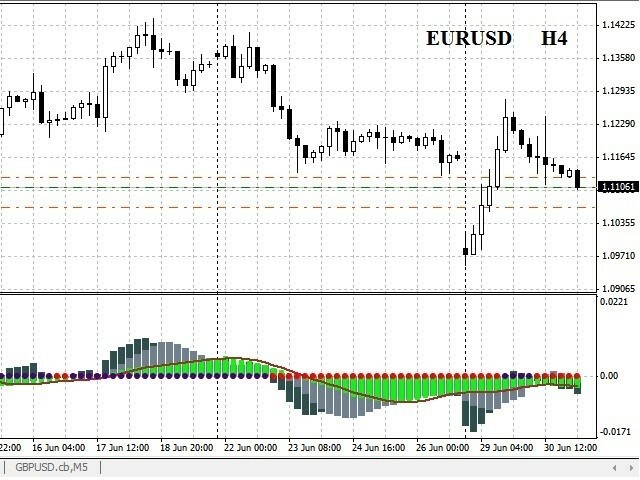 The appearance of the impulse histogram can be interpreted as a signal to open a deal in the direction of its movement or as a signal to place a pending order. A pending order is placed awaiting a slight correction during the impulse movement. If the impulse histogram disappears, then we are in a corrective phase. Now we analyze the correction histogram. During the correction phase, we can consider trading options in the opposite direction. Important! The correction phase lasts as long as the signal signal line is within the signal histogram or until the correction histogram disappears. Once the correction phase is over, we stop searching for the possible entry points in the reverse direction. If we still observe the signal histogram, the market situation should be considered uncertain. We do nothing during this period. 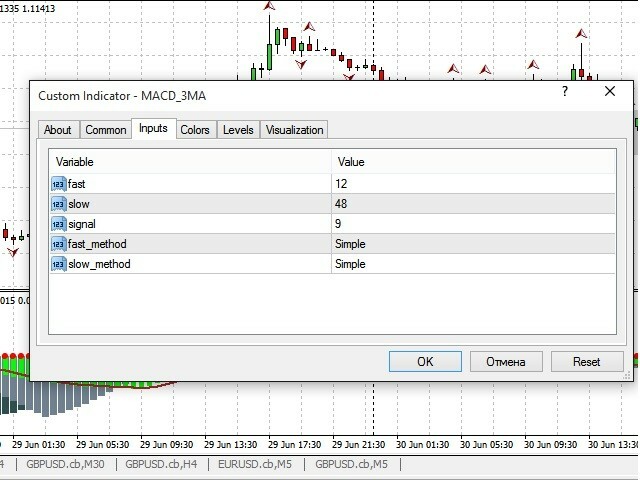 MACD 3MA has an additional filter (red and indigo colored points). Red - downward movement. Indigo - upward movement. The 'slow' value is 3 or more times larger than 'fast'. 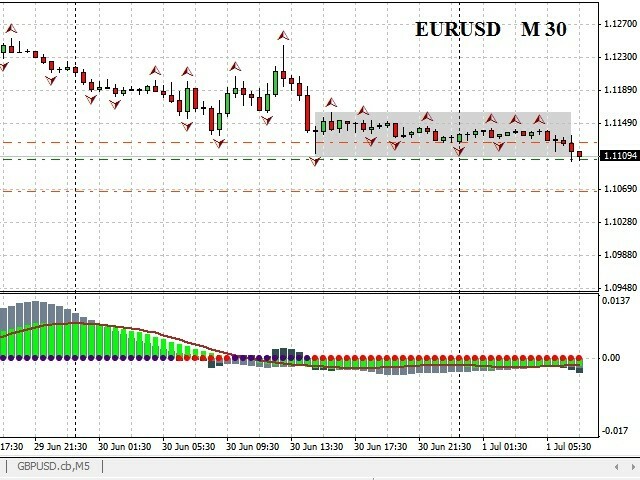 Better use MACD 3MA on two timeframes (higher and working TF). Determine the current phase on the larger timeframe: a) impulse; b) correction. If the impulse phase is detected on the larger timeframe, then wait for the impulse histogram on the working TF in the direction of the higher TF impulse. That's all. If an impulse histogram appears on the higher TF, and it already exists on the working TF, better wait till a new impulse in the direction of the higher TF impulse appears. If a correction phase is detected on the higher TF, wait for an impulse histogram on the working TF, which should be in the direction of correction on the higher TF. That's all. If the correction phase appears on the higher TF, and there is an impulse movement on the working TF, better wait till a new impulse in the direction of the higher TF correction appears. Превосходный индикатор - ядро и основа моей ТС! Автору спасибо и Респект! Made certain changes to the calculation algorithm. Now the signals appear 1-2 bars earlier in most cases.